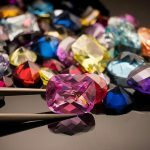 Whether you admire them for their aesthetic value, or if you are just plain curious to know how they influence your life and decision-making abilities, gemstones have always found a faithful following. Even if you are a non-believer of the miraculous properties of gemstones, you have to agree that there is such a thing as good energy. However, all these pundits and astrologers have seldom shown a light as to why these gemstones should be worn or in what ways they affect the wearer’s behavior. To remedy this, we decided to give you a lowdown on 9 such commonly used gemstones. Let’s unearth the secrets behind these radiant rocks, shall we? The name garnet comes from the Latin word “granatum”, which means pomegranate, an ode to its deep red shade. The stone was worn by ancient Greeks and Romans as protective talisman owing to the fact that it protects one from negative energy. It works to provide protection to the wearer and must be worn to avoid accidents while traveling or to keep away recurrent nightmares. This stone is also known as the birthstone for those who are born in the month of February. This purple-hued stone looks good in silver as well as gold setting, giving the wearer plenty of options to choose from. In ancient Greek myth, amethyst was known to ward off the wrath of Bacchus, the Greek wine god. However, wearing amethyst can help one ward off stress and negativity and also lead to an increase in their wealth. This beautiful azure-colored stone not only apes the sea in its appearance, but it also embodies its calming nature. Being a March gemstone, it augurs well for all March-born wearers. It stands for hope, health, and fidelity. It can also harmonize relations, which makes it a perfect gift for a newly-wed couple. You might know of this gemstone as the epitome of luxury or as the ultimate symbol of love, but first and foremost, it is a gemstone with particular properties of its own. Apart from giving you the glam with its bling, wearing a diamond is supposed to imbue one with good thoughts and also inspire them to be confident. It is also said to herald success for those who are synchronized with its energy. Also known as the birthstone for those born in the month of May, this stone has been associated with Egyptian culture for a long time. Considered to be a marker of luxury and opulence, this gemstone makes for a great addition in any piece of jewelry. It is said to be associated with the planet Mercury and is said to favor those who have favorable Mercury in their nativity chart. It is symbolic of love, and generosity. In pregnant women, it prevents prolonged labor. If you were born in the month of March and often feel that you cannot optimize your prosperity and wealth, then this lush, verdant stone is the answer for you. And, yes even jade rollers count! This stone is symbolic of abundance and good fortune. It also motivates you to work to achieve your deepest desires. Even though it is not unearthed from the deepest reserves of the earth, this unique gemstone possesses the ability to have a calming influence on people. Owing to the nature of its origin, it’s quite difficult to source this gemstone, therefore a wide variety of artificial ones are available in the market. If you are looking to purchase one, do so from a certified seller. It is supposed to build harmony between a couple as it symbolizes love and faith. It is also supposed to help its wearer get a good night’s sleep. It also helps in warding off negative thoughts and depression. This red-colored mineral gets its color from the presence of chromium in it. Favored by kings and queens, this stone is often considered a symbol of luxury. The color of the stone itself is symbolic of passion, and love. It is also supposed to aid the capacity of blood to carry oxygen and also protect against negative energy. It is also said to enhance motivation. Not only does this gemstone add a pop of color to your basic outfit, but it also protects you from evil energies. Which is precisely why it was used by the Aztecs in their ceremonial masks and war gear. It is said to imbue its wearer with a sense of calmness and peace. It is also said to possess healing properties. If you’re in search of inner Zen then this might be the answer. Now that we have unearthed all the secret powers of these gemstones for you, you can be more mindful while using them, even if it’s for aesthetic reasons. Do you know of any other secret properties of the gemstones that we discussed above? Share them with us in the comments section.